If you want a scooter then, price, storage, quality and looks are about all that matters because, aside from nitpicking, there’s not much to separate one from the next when it comes to performance and handling. The thing is, if you want style and quality at a low price you’re stuck. Or at least you were until Peugeot launched the Django. It’s got all of the charisma and style of a Vespa, only it costs less. Job done, really. The Django isn’t just a pretender, aping the style of Italian scooters, though – it has heritage all of its own, with styling inspired by Peugeot scooters of the 1950s. It’s nicely finished too, with lustrous paint and sturdy build, plus there are plenty of neat, modern details like the LED running lights and digital instruments. 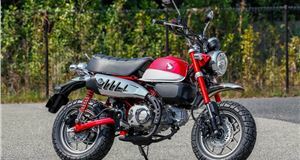 There are three versions – a 50cc, a 125cc and a 150cc. 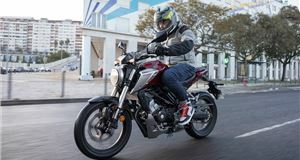 Obviously the learner-friendly 125 is the most important – but the 50cc has its place if you have an AM entitlement on your driver’s licence, or for 16-year-olds. The 150cc version, on the other hand, seems like an odd thing to sell given its limited appeal for those with a full licence. Still, it’s there if you want it. 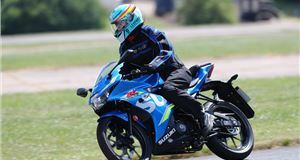 We tested the 125cc version, since it’s the one most people will buy. The engine is a simple, air-cooled single-cylinder with fuel-injection, linked to a typical twist and go automatic transmission. It’s a tried-and-true scooter recipe and it works well here. The Django is incredibly easy to ride, and yet it has a surprising turn of pace, with 60mph easily within reach and just a touch more in reserve if needed. It’s not scooter for long-distance motorway cruising, but if you need to jump on a dual-carriageway once in a while it won’t frighten the life out of you. Really, though, this is a machine for town, like all scooters. It’s comfortable, easy to ride, quiet, nippy up to 30mph and yet small and nimble enough to squeeze through gaps and filter through traffic jams, plus it’s stable and has a nice natural riding position. Ride quality isn’t great though. The little wheels thud through potholes – but through corners it’s predictable enough, even when the weather isn’t great. The brakes are decent too and, while there is no ABS, the brakes are linked. That means the right lever operates the front brake with a little brake force at the rear, while the left lever applies the rear brake with a little brake force at the front. This reduces the chance of skidding, but doesn’t eliminate it entirely. If you ride in all weathers, the Django offers some protection from the elements thanks to its leg shields, but even with a small windscreen fitted you’re still going to get road spray mucking up your visor or face. That’s no different to anything else, though – so not really a point against the Django - and if you spend more a tall screen is optionally available. Elsewhere, practicality is fine if not exactly stellar for a scooter like this. Underseat storage is large enough for a small bag or an open-faced helmet, but a full-faced helmet simply won’t fit. 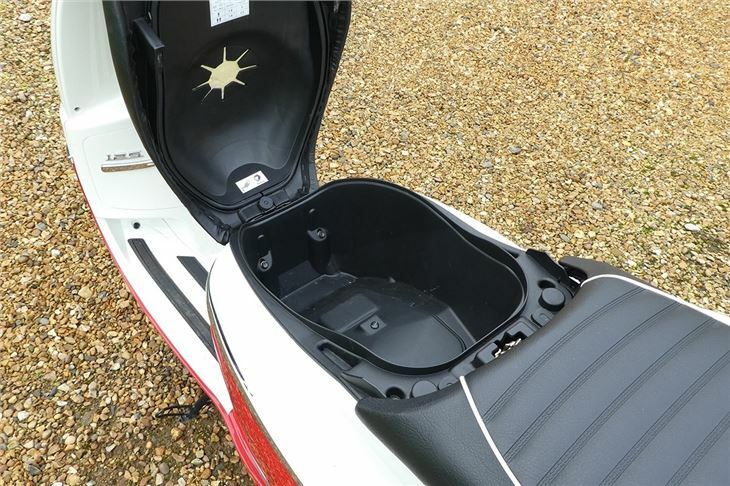 On the plus side there is a lockable storage area in the leg shields that is big enough for a purse or phone, plus there’s a 12v outlet for keeping gadgets charged. There’s also a bag hook for keeping light bags secure between your legs. If you need more storage there is an Allure version that comes with a top box, along with unique colours, or you could fit an aftermarket box to one of the other versions of the Django. Including the Allure there are five variants in total. The model tested here is the Evasion, which has two-tone paint, a dual seat, a front luggage carrier and a windscreen, but there’s also a Sport, with number graphics and a pared-back look, an S with a single seat and matt black paint and a Heritage, with more muted, pastel colours. If you pick a two-seat version and your licence permits, then you could carry a pillion, though we wouldn’t recommend venturing out of town. There are chunky passenger grab handles, sizeable flip out footrests and the seat is quite wide, so passenger comfort is reasonable, but two-up there won’t be much performance in reserve. If you do want to carry a pillion, then you can easily adjust the rear suspension with the bike on its centre stand. There’s a side stand too, if you’re stopping temporarily. As you’d expect, with this folded down the scooter won’t start, but rather frustratingly it will crank over. That means you may end up scratching your head when trying to set off – it would be more useful if the starter didn’t work at all when the side stand was down, rather than letting the engine crank over and not fire up. That’s a minor nitpick though. And so are all the criticisms we have to level at the Peugeot Django, like its sometimes lumpy ride comfort, or limited storage. 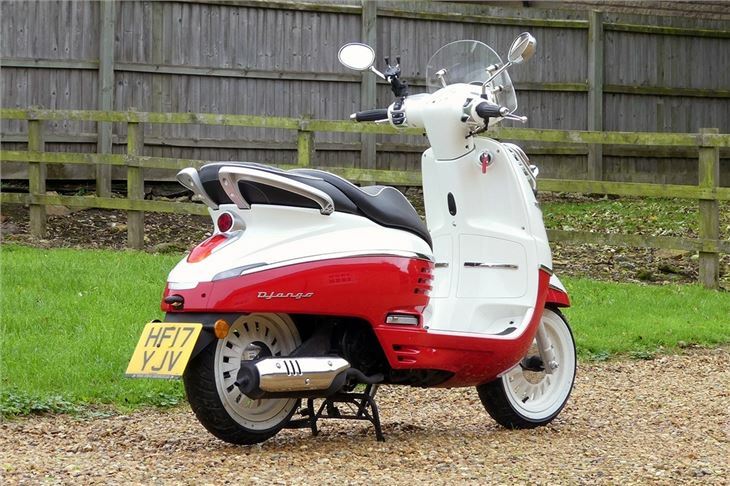 Prices start at less than £3000 - £1000 less than the Vespa Primavera. 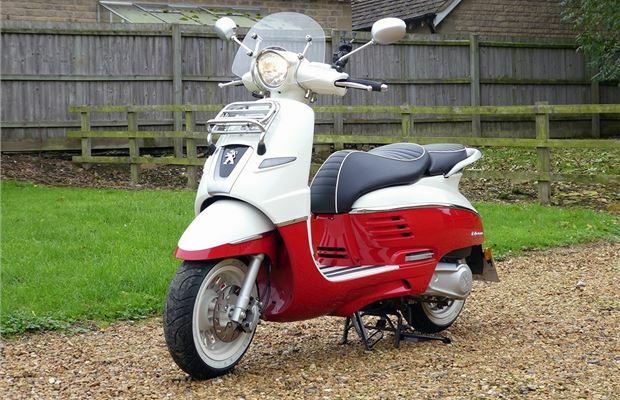 Admittedly the Vespa feels plusher thanks to metal bodywork and it does have that Vespa badge – but if you want that level of style and you don’t want to fork out a fortune to get it, then the Peugeot Django is the next best thing. 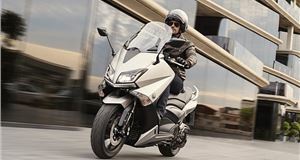 The Peugeot Django range costs from £2599 as a 50cc, £2799 as a 125cc and £3099 as a 150cc. 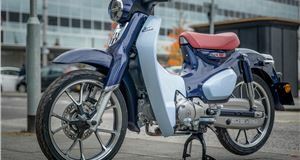 Heritage models come with single-colour paint in pastel blue, black or white, along with a dual seat, 12V connector, LED tail lights and digital instruments. S retro models have a single seat, matt paint and S logos. Sport models silver or blue paint and number stickers. Evasion variants come with white-wall tyres, two-tone paint in red, green, orange or blue, plus a windscreen and front carrier. Allure is the top model and comes with whitewall tyres, two tone paint with brown or silver, a beige seat, a top box and a windscreen. Peugeot Django 125 (125cc) air-cooled single cylinder, fuel injected, CVT automatic transmission; 11PS. Torque figure not quoted - 10Nm estimated. Peugeot Django 125 Top speed 65mph (estimated). Fuel consumption 110mpg (estimated), Annual VED £17.